It’s important to sign up for Sky Poker using the right FTR link and enter the correct Sky Poker promo code during the registration process. A failure to do so could impact your ability to collect bonus funds. Look at the screenshot above to see where you should enter your promo code. In case you receive subsequent promotional offers during your time at Sky Poker, you can enter the codes by vising the “My Account” section and choosing the “Promotions” tab. Once you create your account and enter the promo code POKER during the sign-up process, you’ll receive £10 for free without even having to make a deposit! Only new customers located in the United Kingdom or Republic of Ireland qualify for this offer. The £10 free is issued in the form of tournament tokens (3 x £2.20 and 2 x £3.30 tokens). These tokens can be used to enter SNGs and MTTs. You can even combine the tokens to enter tournaments with a larger buyin, but if you thereby overpay for your tourney entry, you won’t receive any change back. The fact that this no deposit bonus is issued in tokens rather than cash may be unappealing to some players, but this is nevertheless a great offer especially since there’s no wagering requirement attached to the tokens. You have nothing to lose and could score a big payday in the tournaments of your choice. As long as you entered the Sky Poker promo code POKER when creating your account, you’ll be granted a 200% up to £500 bonus on your first deposit. Please note that you must be from the UK or Ireland to take advantage of this bonus. For the next 30 days after your account registration, you’ll earn £10 in bonus every time you accumulate 250 poker points. Earn 12,500 points to unlock the entire £500 bonus! After 30 days, your uncleared bonus will expire. Along with your welcome bonus and £10 in free tournament entries, you’ll get 500 poker points for free. These points won’t count for bonus clearing purposes, but you can use them to enter selected poker tournaments. Each time you tote up 250 poker points, you’ll earn another £10 piece of your bonus. It may take up to 72 hours for each portion of the bonus to be released to your account upon achieving the necessary amount of poker points. After receiving your bonus, you’ll have to play through the bonus amount once before you’ll be able to withdraw it. In tournaments, you’ll receive 10 points for every pound in fees paid. To achieve the 12,500 points needed to clear the whole £500 bonus in tourneys, you’ll have to rake £1,250, giving you a cashback rate of 40%. In cash games, you’ll only get 6 points for every £1 you contribute in rake. This means you’ll have to rake £2,084 before you’ll clear the entire £500 bonus amount. This works out to cashback of 24%. If you decide to play SNGs with this bonus, you’ll have to enter 625 games with a buyin of £20 + £2 before your bonus conditions are completely fulfilled. You can clear the bonus at cash games by playing a bit more than 90,000 hands of £25NL six-max. Check out the sidebar to the right of this page for specific information regarding how quickly or slowly the bonus will clear at different types of poker games. All the numbers in our chart are expressed in terms of dollars, but we’ve calculated them based upon GBP for Sky Poker. The Sky Poker first deposit bonus is respectable for cash games, but it’s truly outstanding if you’re going to use it for tournaments. The only downside is the short, 30-day time frame, so you might have to hustle if you want to utilize this bonus to the fullest possible extent. 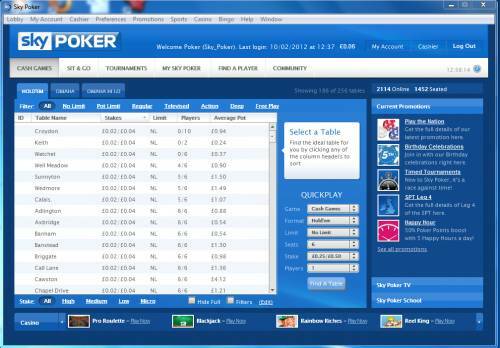 There’s hardly any online poker site without a loyalty program, and Sky Poker is no exception. As long as you can earn 100 poker points in a month (£10 in tourney fees or £16.67 in cash game rake), you’ll derive benefits from the Sky Poker Rewards plan. At the end of every month, your points will be converted into cash at a rate dependent on how high your Rewards level is. At the three highest levels, you’ll be considered a “Priority” player. This means you’ll receive exclusive promotions, a dedicated account manager and will even be able to request an early payout of your points conversion. At the highest Priority level, your poker points will be worth 30% rakeback. 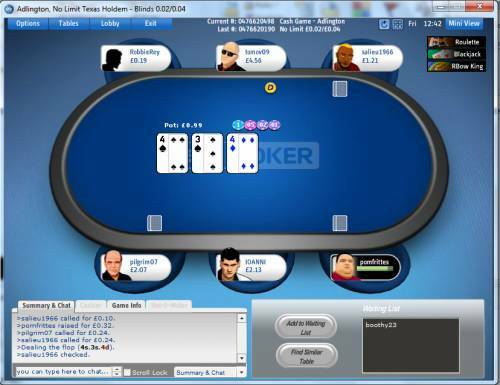 Don’t neglect the soft tables and frequent promos at Sky Poker, particularly if your focus is on tournaments or sit and gos. Sign up today by using the links below.